The Avigilon H.264 analogue video encoder has been designed and priced with a view to really encouraging affordable upgrades from analogue to IPCCTV. HD has always been Avigilon’s speciality but they know that by enabling installers to use legacy kit this will be the way to get their products installed, especially here in the UK. Avigilon has seen some remarkable growth over the last two years and their equipment is second to none. During the recent London riots their equipment was responsible for the majority of ID’s of the rioters and viewing footage of the riots the images they managed to capture really is a revelation. However back to the encoder and with 4 analogue video inputs the Avigilon encoder is specifically designed to integrate legacy analog cameras into a High Definition IP surveillance system. At just 25% of the cost of some of its main rivals this encoder will be selling in its tens of thousands. When you connect an analogue camera into the Avigilon encoder it actually visibly up scales the picture, a fantastic improvement and one end users will love to see. 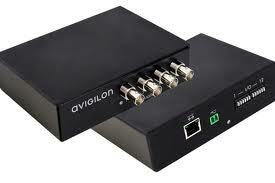 The Avigilon encoder is designed to transmit images over 100BASE-TX. It compresses the images using H.264 technology, and requires minimal storage for video even at high frame rates. The Avigilon encoder uses an industry-leading motion adaptive 3D deinterlacing algorithm to produce sharper and more accurate video and includes an RS-485 interface for PTZ support. For those requiring relay switching an external I/O interface is included, this of course is ideal for alarms.The Avigilon encoder also interfaces with Avigilon Control Center NVMS and HD NVRs. To ensure that the Avigilon encoder can also be used with other IP surveillance systems Avigilon have made the encoder ONVIF compliant. In addition the encoder can be powered by either P O E, 12 Volts DC or 24 Volts AC, and up to 3 units can be stored on a single 1U rack mount space. The unit also has a privacy zone per channel and 4 audio inputs. Add to this 30FPS per channel and this encoder is going to take a lot of beating. We cannot recommend highly enough how important it is to get a demonstration of this equipment. Seeing is believing so the saying goes and once you have seen the quality images that an Avigilon encoder and camera can produce then you will be wanting to to get them on your price list at the earliest possibility. This entry was posted on Monday, October 3rd, 2011 at 20:26	and is filed under IP cameras. You can follow any responses to this entry through the RSS 2.0 feed. Both comments and pings are currently closed.